So this weekend, Austin Books had their Big Annual Sale, where I wound up spending my fair share of coin. I picked up several Superman, Action Comics and Jimmy Olsen back issues. I also picked up this issue of The Flash. 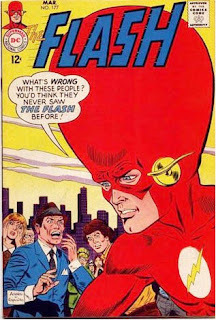 Because when one sees issue #177 of The Flash, one BUYS issue #177 of The Flash. You may not know this, but they recently raised the price of about half the line of comics at DC, while increasing page-count with back-up stories. Detective now has back-up stories featuring "The Question", Action now has back-ups with "Captain Atom" (a move I fully endorse). Best of all, Booster Gold has "Blue Beetle" back ups. I'm not sure what it means to my pocket book as I would most assuredly pick up a Question, Blue Beetle and Captain Atom series from DC. But many comics I'm buying now cost a full dollar more. That's not chump change, week in and week out. So I'm reducing the number of titles I pick up. I'm mostly looking at core titles from DC, and I'll pick up Sherlock Holmes while its running, and Buck Rogers. But everything else...? Well, Boom is still putting out good comics (seriously, Irredeemable is phenomenal. As is "Poe"). But I've dropped the Project: Superpowers books from Dynamite, and I only look at Cap and Dardevil at Marvel these days (a world in which I'm not interested in Spidey. It's a frikkin' crime, I tell you). There are literally hundreds of comics which hit every month, so while you may believe that this superhero/ comic fan has his eye on the industry, I tell you that's near impossible. And at some point, you begin to see the same things popping up on cover after cover, month after month, from upstart companies, new talent, etc... And like any other form of entertainment, 90% of it is dreck. Somehow the confluence of rising prices and my disinterest in a lot of what's on the shelf has meant I'm becoming increasingly keen on reprints and back-issues these days. Back-issues are those bagged and boarded comics someone else was saving, believing they'd pay for a car or semester of college at some point. "Old Comics", I guess, most of which are worth nothing, others are worth more. Reprints are collections of that same material. 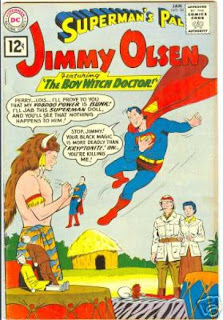 Oh, Jimmy Olsen, what freakish bull@#$% are you up to this issue? It may also be a time issue. In Arizona, I genuinely DID have time to scour the internet and find new comics. Less so these days, so when I do stumble across something cool, like "The Stuff of Legend", I'm far more impressed and surprised. And part of me knows my tastes are also getting a little more focused as I try to figure out (sigh) even more about Superman comics. There's 70-odd years of the stuff out there now. And that's not a bad thing. That just gives me something to do for a couple of decades while I catch up, both by reading reprints, and by filling out my own Superman collection of original print issues (which, yes, I do read). And, no, I have absolutely no idea how many Superman stories I've read in my lifetime. Let us say its been lots and lots. But there are literally thousands more out there, when one considers two major Superman titles and the ancillary titles that each had long lives of their own (Superboy, Supergirl, Jimmy Olsen, Lois Lane, Adevnture/ Legion, etc...). So there's plenty to keep me busy. 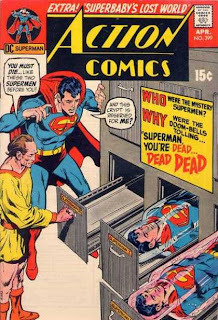 I love the prestige reprints, such as the new "DC Comics Classics Library", but would point you first to the super-affordable "Showcase Presents" format, which collects 500 pages of comics for about $15. That's a whole hell of a lot of whatever character you want to check out, and they've covered all sorts of characters, from the obvious (Batman) to the less so (Elongated Man). Not bad when one considers the cost of those back issues (36-48 pages) ranges from $2 - $250,000. Anyway, all this talk is inspired by the issues I was able to pick up and some Flash reprints that showed up in the mail last week. So I'm going to go read some comics. I've scaled way back on my weekly comic purchases. The $1 increase in the price of a book was certainly a factor. It's gotten to the point where I can't afford to buy a crappy story. I've pretty much converted over to trades for everything now. I've even dropped getting JSA on a monthly basis. The switch from Johns to Willingham and Sturges predicated that change. I use podcasts now to find out great stories that I otherwise might have missed. It's been working out pretty well for me so far. Plus, it's always fun to go hunting for back issues trying to complete a run. It hearkens back to the days of yore where I didn't pre-order my books 3 months in advance. Dare I even ask whether you've ever attempted to guesstimate how much money you spend on comics in a given year? I actually spend more on comics alone than I earn. But there's still money left over for Tex Mex. S'weird. I'm with Simon on dropping JSA for trades. That's a good plan. I do listen to a comics podcast from time to time, but not all that frequently. Yeah, I'm not going to one JSA title written by Johns to two separate titles written by Willingham and Sturges. I haven't been impressed with what they've written so far. 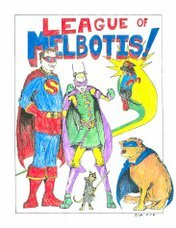 It sort of kills me, because Willingham's superhero stuff feels so stuck in about 1982, and I know he's buddies with all the DC folks, but... man. Its everything stiff and boring I didn't like about DC as a kid. And I WANT to want to read about Power Girl, Mister Terrific, Alan Scott, etc... I just really am not feeling it. And I've been reading these characters every month since DC launched JSA. Yeah, I have a complete run of the JSA in a mix of trades and issues and I've been collecting it ever since its re-launch as well. I love the golden age heroes re-imagined for our times. JSA: The Golden Age by James Robinson was great and so is Sandman Mystery Theater by Matt Wagner. I'm hearing good things about JSA vs Kobra and I'm going to have to track it down.